I’ve long been a passionate fan of the beautiful Greek Islands and am always delightful to discover one I’ve not been to before. 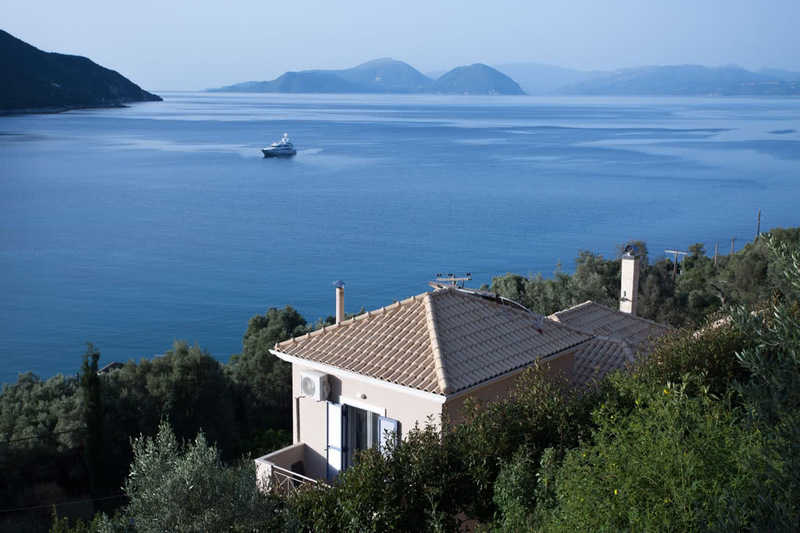 Lefkada is one of the Ionian’s most unspoiled islands, connected to mainland Greece by a causeway it boasts the usual Greek island wonders; stunning beaches, timeless traditional villages and those turquoise waters. It’s a real romantic getaway kind of a place, so stay at the beautiful Calm Wave Villas; the name gives away exactly what you’ll find at these luxurious villas. 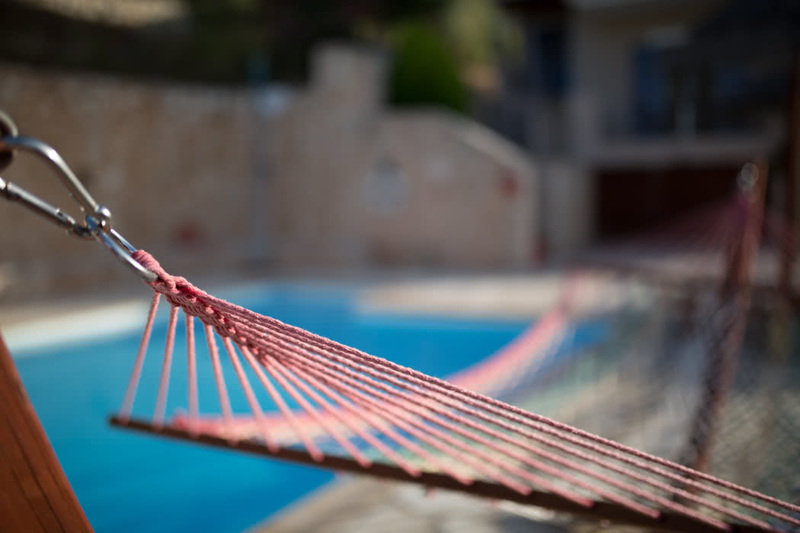 Calm Wave Villas are ideally positioned just 20m from the beach and 1km from the scenic village of Vasiliki. Vasiliki Beach is popular with water sports lovers and families with kids; it’s a lovely sandy beach with shallow waters. It’s also rated as one of the top ten best beaches in the world for wind surfing! There is a pretty harbour and you can spend many a happy day strolling the waterfront stopping at shady tavernas or shopping in the boutiques that line the main street. 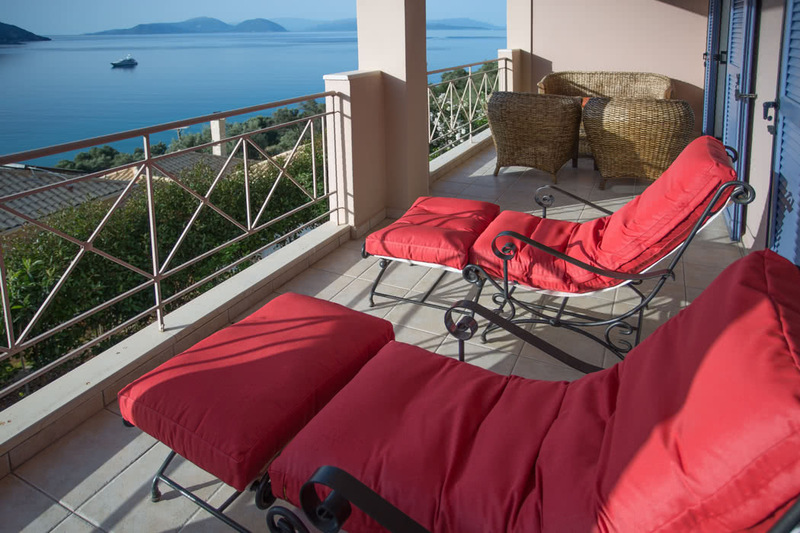 There are two villas at Clam Wave Villas – Villa Elena and Villa Eirini and both are spacious, cool, contemporary spaces. The views from the villas are simply sensational. And they are designed to really make the most of the views, so they follow you, as you head from the bedrooms, to the huge balcony by the kitchen, to the pool area; everywhere you go the Mediterranean Sea views are with you. Both of the villas comprise of 155 sqm. of internal living space across 4 levels. The bedrooms are on the first two levels and the top level, the third level is all about entertaining. A large living room features all the tech you could wish for; Smart TV with satellite channels, a home cinema with USB, PS3 console with games and a Hi-Fi system. Despite the great facilities, with all the sunny days, outside is most likely where you’ll want to be. Luckily, there is a beautiful private swimming pool surrounded by loungers and umbrellas, and yes with those views too! There’s also plenty of parking, air-conditioning and central heating and loads of extras like a movie collection, board games, books and a high chair, as well as complimentary Wi-Fi. There’s little to choose between the villas, Elena is set higher up and so is accessible by stairs. Perhaps not so suitable for the very young or very old but it does mean your views are even better. 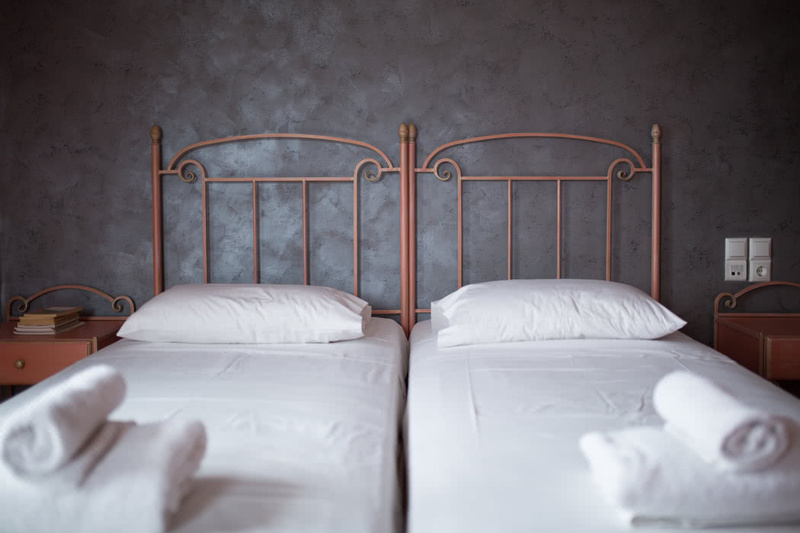 The service here is great, the rooms and communal areas are kept spotless, your welcome package includes wine, traditional delicacies and everything you need to cook up a delicious breakfast. The owners are very happy to furnish you with local tips, everything from the best local restaurants to walking trails to the best beaches and secret coves to visit by boat! Each villa can comfortably sleep 6 across 3 bedrooms. All the rooms have their own bathroom and their own level so there is a nice feeling of privacy. The first level bedroom is king side and has a sofa bed (ideal for families with small children) as well as a Jacuzzi bathtub, it also has an independent entrance. The second level bedroom has twin beds and a balcony and on the top floor the bedroom has a king size bed and of course, rather special views. 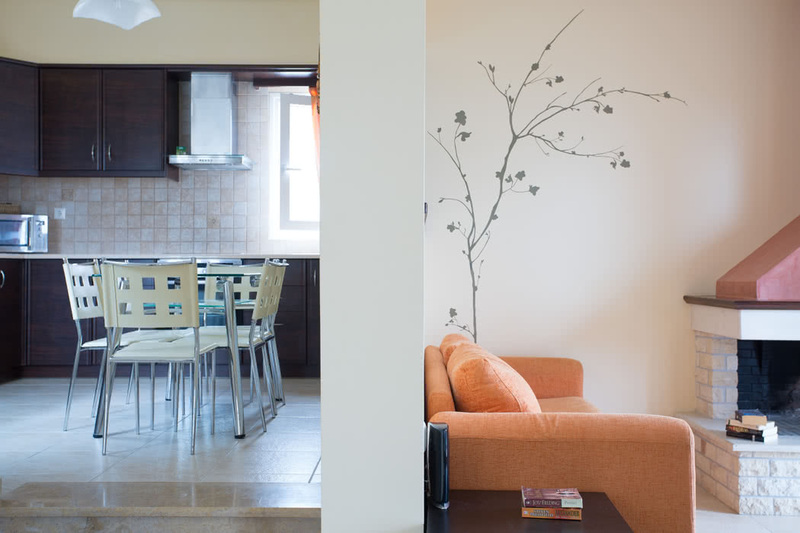 Cooking yourself is genuinely a pleasure here, there is a large, open, fully equipped kitchen in both villas. Outside you have a built in BBQ and you can dine al fresco; at breakfast there’s a lovely shady spot and as the sun sets opt for the table on the terrace and admire the views as you eat. There are of course, plenty of tavernas and restaurants in the village so make sure you have a night or two off cooking and sample the nightlife of Vasiliki.